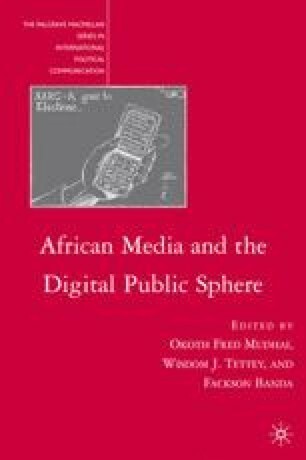 In an increasingly networked and globalized—or globalizing—society, the recent emergence of new information and communication technologies (ICTs) in a fast-pluralized media ecology presents challenges for most of Africa’s hitherto state-dominated “big man” politics. We argue in this chapter that in situations of political-ethnic conflicts, new digital tools produce opportunities for propaganda, but at the same time they also offer new possibilities for counterpropaganda. Alternative information from blogs, e-mail lists, Web sites, especially through NGOs with Web sites and e-mail networks, have—in addition to cell phone text messaging—complicated recent political contests linked to socioeconomic tensions. This chapter not only analyzes the links between violence and electoral politics but also examines the contribution of new ICTs in exacerbating or ameliorating inter-“ethnic” and interparty violence—especially around national polls in selected African countries. Kimemia, N. 2008. Where Life is Nasty, Brutish and Short. Sunday Nation, May 20. www.nationmedia.com/dailynation/nmgcontententry.asp?category_id=39&newsid=124032 (accessed May 25, 2008).